Mark Barroca of Star passes the ball as he is guarded by Aljon Mariano of Ginebra at the start of their semifinal series last night at the Smart Araneta Coliseum. MANILA, Philippines - Star dragged Ginebra into a tight contest last night and got away with a 78-74 victory at the start of their best-of-seven semis matchup in the PBA Philippine Cup at the Smart Araneta Coliseum. The Hotshots trailed by 10 points a couple of times in the first half, took the upperhand in the third quarter then held off the Gin Kings down the stretch for the morale-boosting win. Paul Lee took charge when it mattered. His three-point shot with less than four minutes remaining broke the game’s 11th and last deadlock and gave Star a 74-71 advantage. Ginebra threatened at 74-76 on LA Tenorio’s own triple but Lee struck back, scoring off three defenders to give the Hotshots a four-point lead with only 24.9 ticks left. That proved to be the biggest basket of the game. The Gin Kings couldn’t get it done despite the early lead, and with 24 turnovers in the game were just lucky to still have the chance to win in the end. Ginebra coach Tim Cone should be disappointed with the performance. At times during the game, he yelled at his players. Some responded well while others couldn’t. Just the other night, Ginebra was at a high, overcoming Alaska’s twice-to-beat advantage to reach the semis. But against Star, the magic was gone. Star will carry the 1-0 lead when the series resumes tomorrow evening at the Mall of Asia Arena. Back-to-back champion San Miguel Beer seeks a 2-0 lead against Talk N Text tonight at the MOA Arena. “We can’t celebrate. It’s only game one,” said Star coach Chito Victolero, who must have lost track of the Hotshots own winning streak. “Seven na ba? (Is it seven? )” Victolero asked reporters. “This will be a grinding series. It’s only game one,” added Victolero, who made the sign of the cross walking off the court after the win. The Hotshots shot poorly from the floor, making only 31 of their 81 attempts. But they made the big baskets in the end, those from Mark Barroca, Marc Pingris, Raffy Reavies and Lee. Veterans Sol Mercado and Tenorio, as usual, tried to carry the fight for Ginebra. But they couldn’t buy any basket in the end. 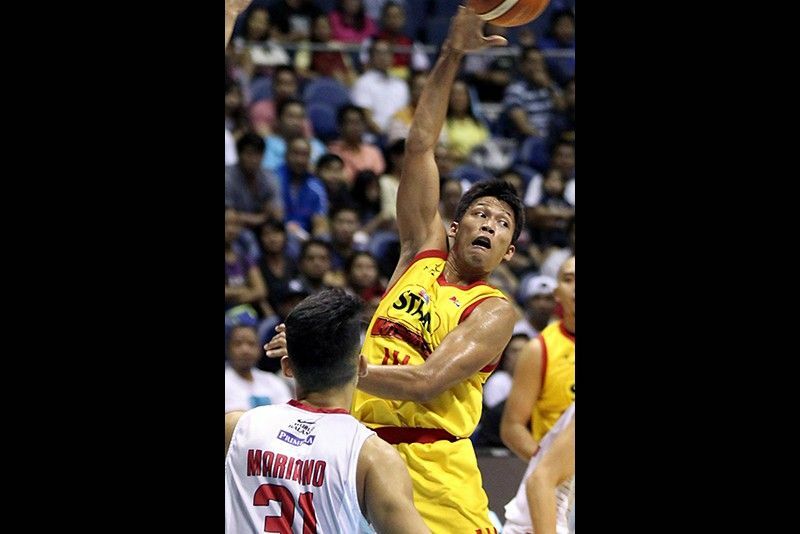 STAR 78 – Lee 18, Barroca 17, Pingris 9, Sangalang 8, Maliksi 7, Jalalon 6, Reavis 5, Melton 5, Dela Rosa 2, Ramos 1, Brondial 0. GINEBRA 74 – Aguilar 11, Ellis 12, Cruz 10, Mercado 10, Tenorio 8, Thompson 7, Ferrer 7, Marcelo 5, Mariano 4. Quarterscores: 14-19, 37-38, 60-58, 78-74.